In a food processor with an "S" blade, process all ingredients until smooth and like soft serve ice cream. It can take just a bit of scraping and adjusting to get it to process completely. Add just a tiny bit of water if needed to help blend. Serve with an edible flower garnish if desired. 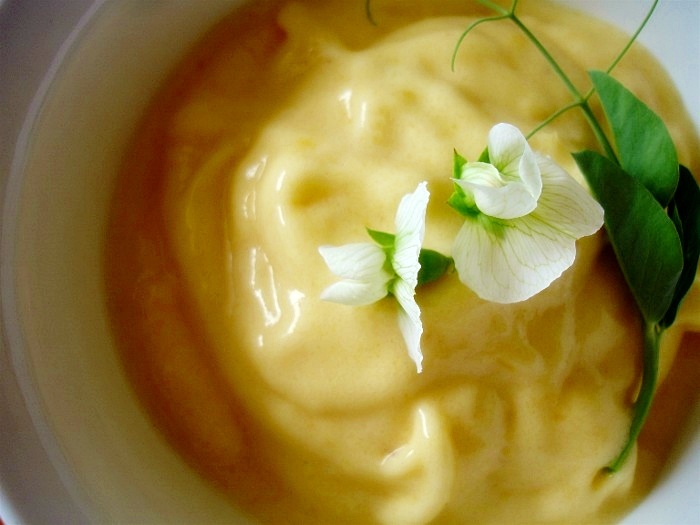 Yes banana ice cream is the best, but this recipe sounds fantastic too! Wow!!! Ice cream....I love it. Thanks for sharing the recipe. I will surely try this out. Oh your banana mango softserve looks soooo creamy and wonderful. Love it!! I saw this in the morning and wanted it for breakfast :) The pea blossom is beautiful! That photo is simply gorgeous! Wow, that looks amazing. What else can you use for garnish besides pea blossom? Kind of afraid to try just any old flower. Just made this sans mango with a little unsweetened cocoa powder. SO good!! !